The US Supreme Court will be hearing a case – known as King v. Burwell – this coming week on whether or not the federal healthcare exchange program, known as Healthcare.gov, is legal. The question before the Court is whether or not the Affordable Care Act (ACA) allows for subsidies for healthcare premiums in any of the 34 states that refused to set up their own healthcare exchanges under the ACA. The plaintiffs – four people from Virginia – argue that the federal government misinterpreted the ACA in regards to the subsidies. They argue that the law only allows for subsidies in states that set up a state-based exchange. Virginia in one of the 34 state who opted out of a state-based exchange. These four individuals, who don’t want to purchase insurance, say that without the subsidies, they would not have to either buy insurance or pay a penalty since they do not make enough to afford healthcare without the subsidy*. The Obama administration argues that this is a politically motivated argument to narrowly interpret a couple of words found in the ACA in order to gut it. If the US Supreme Court invalidates the Healthcare.gov websites in all of the states that refused to set up their own healthcare exchanges, everyone who gets a subsidy to purchase their health care through the exchange will lose that subsidy. According to the Washington Post, this type of ruling would affect about eight million people across the country. That’s about 87% of all Healthcare.gov users nationwide in the 34 states that did not set up a state-based exchange receive. In Pennsylvania, somewhere between 70-84% of all users of healthcare.gov receive these subsidies. The subsidies in Healthcare.gov currently reduces healthcare premiums by up to 72% of the full premium, depending on the size of one’s family and family income. So if the Court holds that subsidies within the Federal Healthcare exchange are illegal, premiums for individuals needing these subsidies will dramatically increase; out-of-pocket premium increase could amount to an average increase of 256%. This increase could begin in as little as 25 days after the ruling is made in June 2015. OR the Court could set a date further in the future to allow some time for transition. What would the end of these subsidies mean? Healthcare in the 34 states in the federal exchange program would destabilize. The predictions include lots of people – mostly the young and the healthy – ending their insurance, insurance companies pulling out of the exchanges in these states, lots of layoffs, and a return to uncovered people attempting to get care in hospitals without any coverage. Those left in the exchanges after the young and healthiest leave are the older and the sickest individuals. Insurance companies will begin to feel the pain and start to pull out of the exchanges as participation in the exchanges would no longer be financially viable. With fewer people seeking care on the federal exchange, thousands of people hired by the insurance companies and by the federal exchange system will likely face layoff. In addition, hospitals will once again see a surge in the uninsured arriving on their doorstep for care. People Leaving the Market Followed by Premium Increases for Those Who Remain. As a result, the elimination of the subsidies would destabilize the individual insurance markets in states not running their own marketplaces. Under the ACA, insurers would still be required to guarantee access to coverage irrespective of health status and prohibited from charging sick people more than healthy people. Even without the subsidies, many people who are sick would likely find a way to maintain their insurance in the face of substantial premium increases. However, people who are healthy would likely drop their insurance. Insurers in the affected states would immediately find themselves in a situation where premiums revenues were insufficient to cover the health care expenses of the remaining enrollees, who would be far sicker on average than what insurers assumed when they set their premiums for 2015. This would trigger a classic adverse selection “death spiral,” where insurers would seek very large premium increases, which in turn would cause the healthier of the remaining enrollees to drop coverage…. Insurance Companies Leave the Market and Layoff Employees…Under ACA regulations, premiums for insurance sold inside the marketplaces are locked in for a full calendar year. So, the earliest those premiums could change would be January 1, 2016, though even that would be tricky since insurers will have already submitted proposed 2016 premiums to state insurance departments by the time the Court issues a decision. Depending on state laws, premiums for products sold outside of the marketplaces could potentially be increased more quickly. And even if insurers could adjust rates, establishing stable and sustainable premium levels in this type of environment is extremely difficult, because as rates move higher, more of the relatively healthy enrollees drop their coverage. Because this may all happen very quickly, it is possible that many or all insurers would choose to exit the individual markets in these states rather than facing significant losses in a quickly shrinking market. Insurers that remain in the market risk being one of the only carriers continuing to guarantee access to coverage to people in poor health (since people who lose coverage from exiting insurers have special enrollment periods to choose new coverage). Since it is unlikely that Congressional opponents to the ACA would be willing to craft a law allowing for subsidies within Healthcare.gov should the Court overturn this portion of the ACA regulations, the burden of the fix falls upon each of the 34 states. Some of these 34 states will allow the healthcare exchange to die with the dire predictions quickly coming to fruition. Others, in advance of the Court’s hearing and decision of this case, are starting to talk about alternatives should the Court outlaw the subsidies in their states. One of these states attempting to deal with this possibility is Pennsylvania, where I live. The insurance companies and hospitals throughout the state, fearing for their livelihood, are lobbying the PA General Assembly to set up a state-based exchange system. Tom Wolf (D), our new Governor, has said he is interested in setting up a state-based exchange. The question then becomes, where would the money for the set-up of a state exchange come from in a state that has a large budget deficit since federal dollars for such a set-up are no longer available. Might this be a great time to lobby for a universal health care plan for Pennsylvania? As well as in the other 21 states currently working towards such a solution as well? …create one insurance plan that has one single payer, to cover all Pennsylvania taxpayers. The premiums for The Pennsylvania Health Care Plan would be a flat rate of 3% of income for individuals and 10% of payroll for businesses. The Pennsylvania Health Care Plan would place you and your healthcare provider in charge of you and your family’s healthcare. The plan will be a public/private hybrid with the insurance function provided by the state government and the medical care would be privately delivered. It’s cost effective. It covers everyone. It’s comprehensive in that it covers all medical treatment, dental care, eye care, physical therapy, mental health treatment, hospice care, treatments for addiction, long-term care, access to wellness programs, prescription drugs and emergency transport. And you won’t need an army of navigators in either a state- or a federal-based healthcare exchange to help you interpret your plan. Check out Healthcare for All PA for more information on this bill and become a citizen lobbyist for comprehensive health care that allows you access to the healthcare you need and want without bankrupting you, your family or your neighbors. *NOTE: The four plaintiffs in this case before the Supreme Court–David King, Douglas Hurst, Brenda Levy and Rose Luck—appear to be either ideologues and/or guinea pigs for the libertarian Competitive Enterprise Institute (CEI). CEI is an organization committed to overturning the Affordable Care Act. If the subsidies are overturned, all four of these individuals may not even be affected by the Court’s ruling according to a February 9 article in Mother Jones. Three of the four – Levy, King and Hurst – are now or soon will be fully eligible for Medicare. Two of them – King and Luck – already qualify for a hardship exemption from purchasing healthcare and/or paying a penalty due to their relatively low-income levels. However, the issue of “standing” (the legal argument that they would actually be harmed if the law were to continue), for some reason, has not been raised in this case by the Obama administration and will not be considered when the Court hears the case next week. If you live in the South, your access to reproductive health services is greatly reduced. The same is true for a few other states, like Ohio, Indiana, North and South Dakota, and Wisconsin. Why? Because the legislators in 27 states have decided to place themselves and their misogynistic beliefs between the decisions you would normally make about your reproductive health in consultation with your medical care provider. And in 18 of these states, the legislators are considered to be “extremely hostile” to women’s healthcare. It’s gotten significantly worse in the last four years. State legislators have placed restrictions on access to abortion as well as on family planning and related services. Here’s more to this story. Read below and then check out the full report at the Guttmacher Institute. 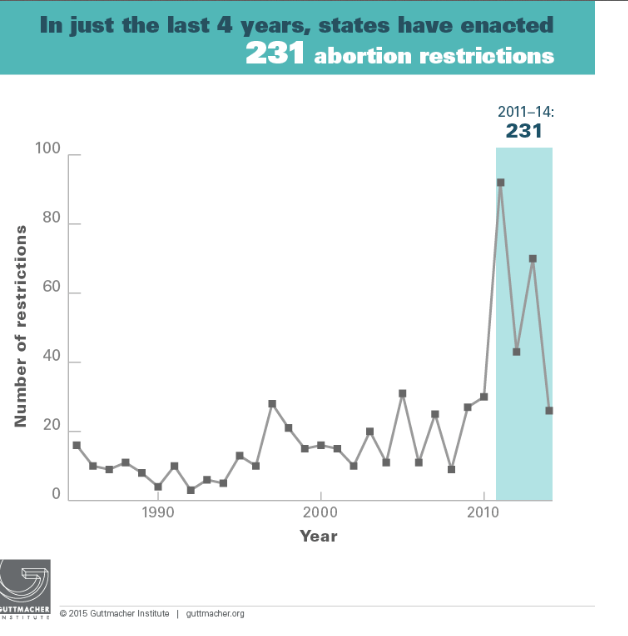 From 2011 to 2014, the number of legislative restrictions against abortion rights skyrocketed to 231, quadrupling the number of restrictions within just three years. In 2014 alone, legislators enacted 26 brand new measures to restrict access to abortion rights. According to a new report by the Guttmacher Institute, the number of measures enacted are not just surging, but the severity of these ‘hostility’ classifications is alarming and threatening to women’s rights. The same 18 states keep introducing these measures, and all of these states lie in the South and Midwest. 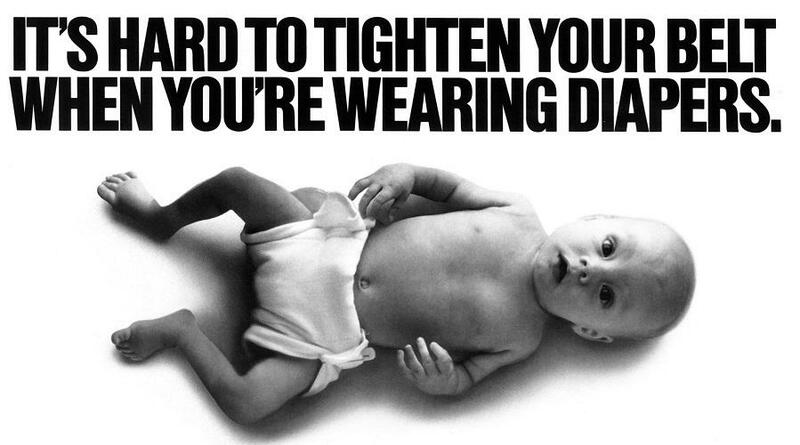 According the report, thirty-eight percent of the country is now considered to be extremely hostile to abortion rights. What does it mean when a state is “extremely hostile towards abortion”? To all my friends, colleagues, readers, and fellow advocates, I’d like to share the Valentine’s Day card and sentiments my husband sent to me this morning. Happy Valentine’s Day to you and the world. Thanks for all you do for equality and fairness here at home, across the country and around the world. Thank you for your support, your advocacy, your concern for others, and your willingness to speak out on the issues you are passionate about. 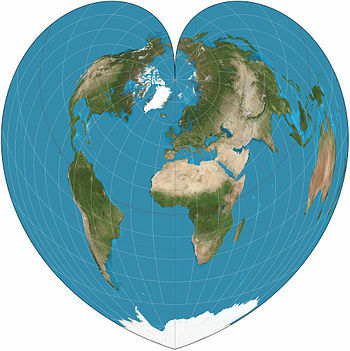 PS if you would like to learn more about this actual heart-shaped Werner cartographic map, click here and here. Yesterday, I received a phone call from Paul Wommack, a Beaver Valley NOW member and activist. He alerted me to an online effort to influence Congress to support President Obama’s proposed budget. This budget was officially released this morning. Part of the proposed budget would add new investments in child care programs and increase access to community colleges across the country. It also will, if passed, start to reverse the damage that has been made to social service programs due to, among other things, the sequestration mandate of the past several years. 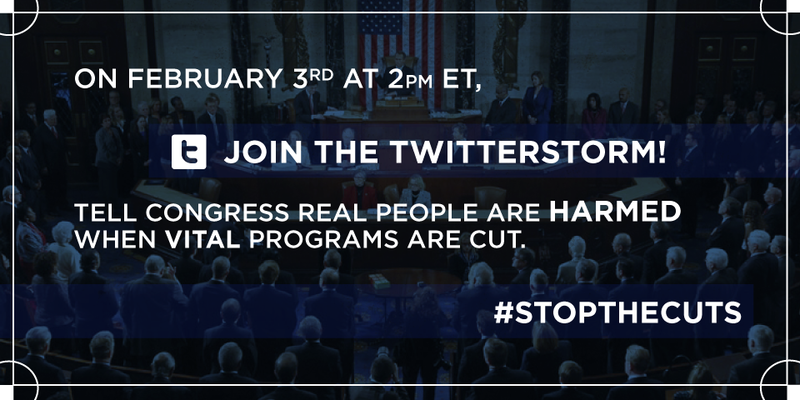 As a result of this positive change that could come at the Federal level IF Congress listens and passes a budget to “Stop the Cuts” to our social network fabric, the Coalition on Human Needs has organized a “#StopTheCuts” Twitter Storm for Tuesday February 3, 2015 at 2 pm EST/11 am PST. Here’s their announcement with details in case you too would like to participate. This coming Monday the President will present his budget request to Congress for FY2016. We look forward to reviewing the President’s proposals, and we’ve already heard about important investments he’d make in child care and community college. We’ve heard he will start to reverse damaging cuts to human needs programs. Our next step: we need you to join us in telling Congress our request – stop the cuts. On Tuesday, February 3rd at 2pm ET/11am PT, join the Coalition on Human Needs, MomsRising.org, MoveOn.org, and other national organizations [including the National Organization for Women] for a Twitterstorm (sample tweets and graphics below!). 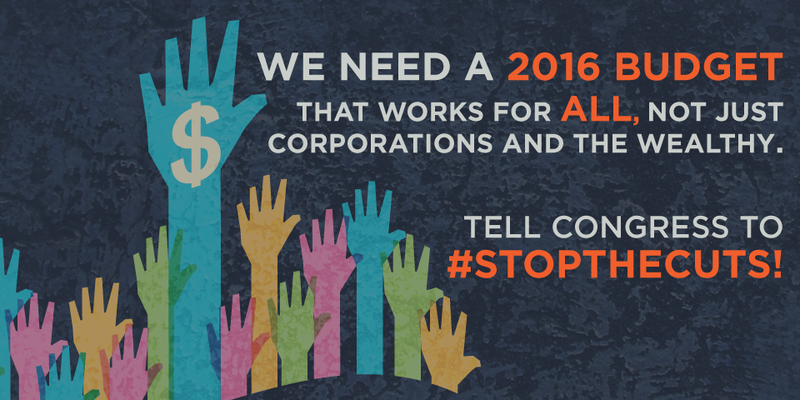 Tell Congress that their FY2016 budget must protect programs that promote shared prosperity and help our nation’s most vulnerable. But if the new Congress drafts a budget anything like the one the House passed last year, these successful programs will be slashed, along with education, housing, nutrition, and other services young and old alike need to escape poverty. These will be on top of years of cuts that are keeping us down. 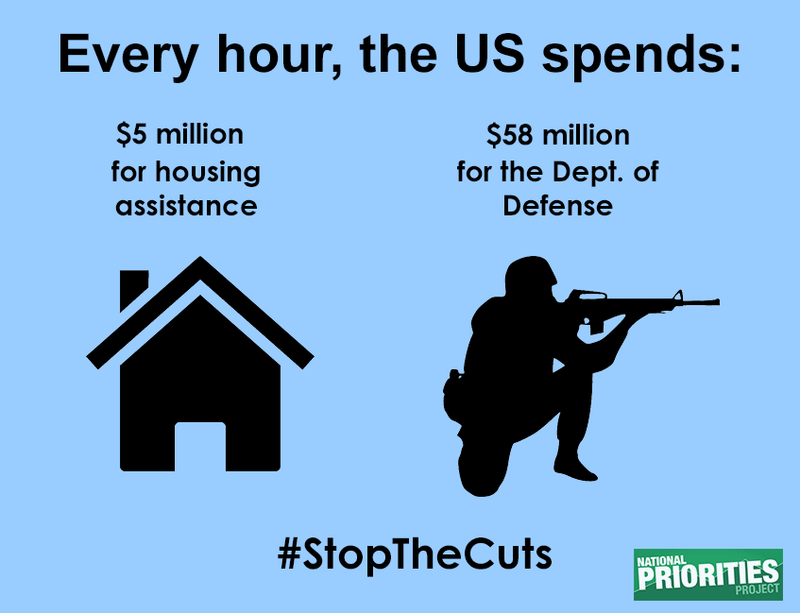 It’s time to tell Congress to #StopTheCuts. Tell Congress real people are being harmed. On February 3rd raise your voice for human needs and share the real struggles people in your community face and the impact of cuts. Below are sample tweets – but we encourage you to tweet at your Senators and Reps with personal stories, too. What? A twitterstorm telling Congress to stop cuts to the programs that are most important to our nation’s future shared prosperity and ending poverty in America. How? 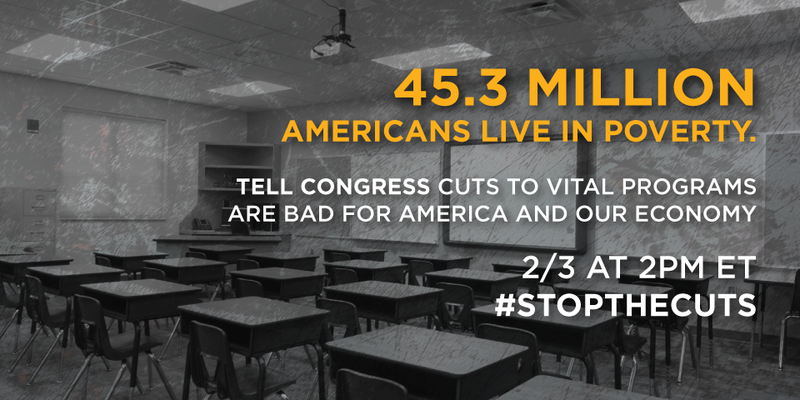 Post the tweets and graphics below telling Congress to #StopTheCuts because #CutsHurt. 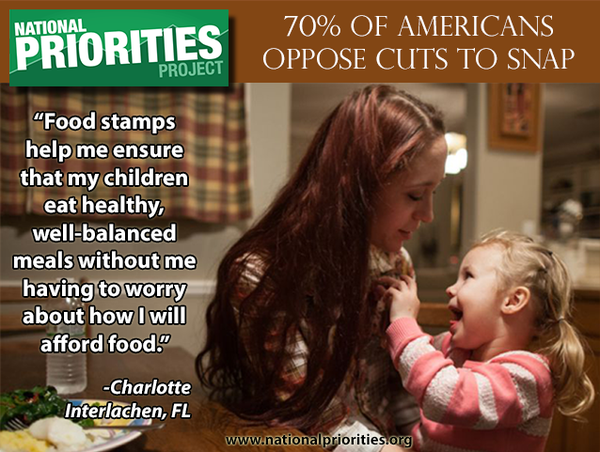 Have you or someone you know benefited from the programs facing cuts? Get personal! Please spread the word and email your networks and this event. Here is the link to our blog post with this info. If your organization plans to participate, please RSVP to Joanna at jsandager@chn.org so that we can list you as a participant. And make sure to follow us on Facebook and Twitter at @CoalitiononHN for the latest.